CEDAR CITY — The Bureau of Land Management-Utah Cedar City Field Office held an open house Thursday at Southern Utah University’s Cedar Breaks room 141 in the Sharwan Smith Student Center in Cedar City at which BLM representatives discussed upcoming plans for the implementation of over 100 miles of mountain bike and other recreational trails throughout the area. 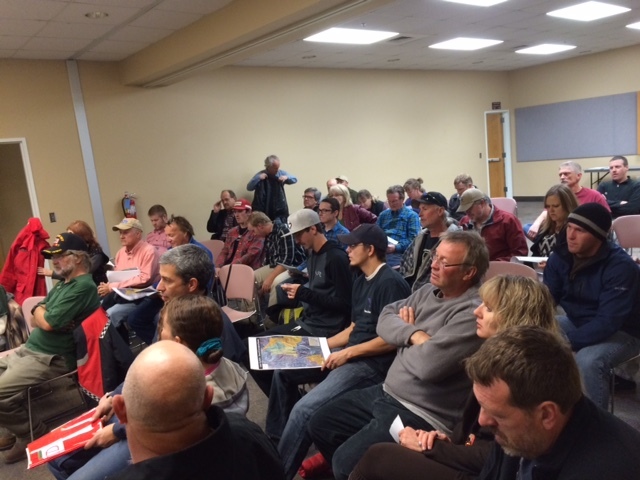 At the open house, Dave Jacobson, the outdoor recreation planner for the BLM in Cedar City, gave a brief summary of the BLM’s plans for the trails and gave audience members a chance to ask questions and address any concerns they had about the project. The International Mountain Bicycling Association designed the trail system, which will extend from Fiddlers Canyon to the Shurtz Canyon area, Jacobson said. If everything goes as planned, the Cedar City community could see new trails by the end of 2015. 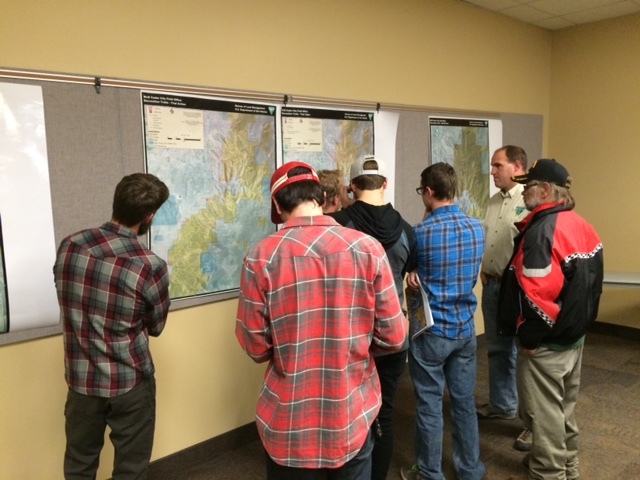 “We’re going to try to get 15-20 miles of new trail on the ground in 2015,” Jacobson said. Those miles could consist of completely new trails constructed from scratch, or they could incorporate some sections of previously existing trails, Jacobson said. 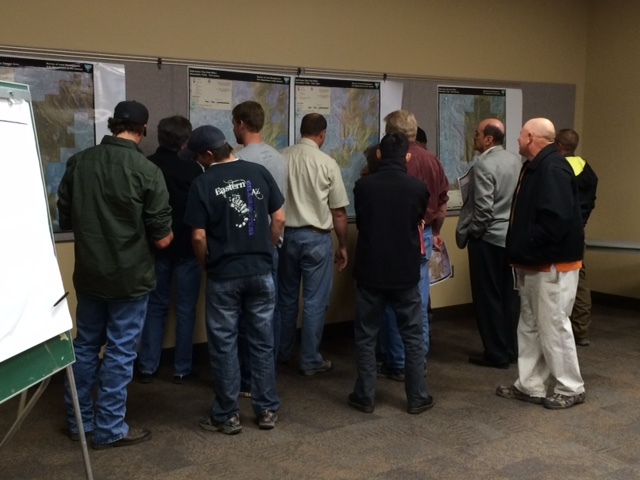 One purpose of the open house was to get public feedback on the areas they wanted to see work completed on the fastest. The official name for the trail system has not been decided. In order to help remedy this, Johnson said that those attending the open house should share their ideas for possible names for the BLM to consider. An environmental assessment prepared for the trail system may be viewed here. Some in attendance voiced their concerns regarding safety on the trails, especially if trails were used by a combination of cyclists and people on foot. Jacobson said the BLM could consider the possibility of implementing a sign system encouraging trail users to use bells on their bikes. 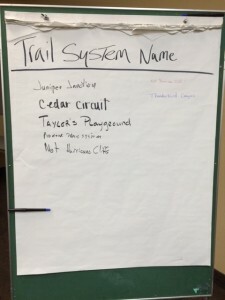 Jacobson also said some trail sections would only allow for a certain type of use; such as, a trail set up specifically for motorized vehicles or one set up for people to walk and hike. Another concern brought forward from members of the community was the possibility of a trailhead in the Thunderbird Gardens area and how the BLM plans to set up a trailhead in an area where shooting firearms and dumping trash is common. Thunderbird Gardens is within city limits, Jacobson said, so shooting guns there is technically illegal. Hunter Safety training sessions are also conducted in the area, so the BLM is working with Cedar City to find an alternate location for those trainings to be moved to. The actual construction of the trails is going to be a big hurdle for the upcoming project as well, Jacobson said. Some of the areas will be tough for trail builders to access because of their location and soil makeup. Trails will likely be built by a combination of community volunteers and paid workers. Much like the mountain bike trials at the Three Peaks Recreation Area, Jacobson said, there will be days for volunteers to go out and assist in the building. The overall cost for the project is unknown, but Jacobson said he estimates it will cost about $5,000 per mile of new trail. Some funding for the trails will come from funds set aside for recreational projects, and the BLM will also be looking into donations and grants. “We have some funding, but we’re definitely going to have to go outside of the BLM to have enough money,” Jacobson said. Once completed, this trail system could be a big draw to Cedar City for those who love to mountain bike, Jacobson said. The trails include a wide variety of mountain bike courses including some all-mountain and downhill portions that are relatively unseen in other areas. Cedar City resident Kelsom Owens, an avid mountain biker, said he transferred to the sport from riding dirt bikes and looks to it as a way to get out in the fresh air and stay active. The mountain biking community in Cedar City is young and relatively small, Owens said, but hopes are high that the new trail system could encourage others to get out and try mountain biking even if they have never done it before. While his favorite form of mountain biking is downhill, Owens said, he loves all aspects of the sport and is excited about the possibility of such a large trail system that incorporates all different riding styles. “This is what I’ve dreamed about since I started riding bikes and I’m glad to see that there may be more places to ride in the near future,” Owens said. 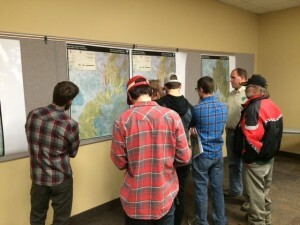 The open house was a success, Jacobson said, because it brought people together to share ideas, people who are passionate about outdoor recreation. And it got people excited about better using public lands, he said. The feedback and concerns expressed will better help the building of the actual trail system once it comes around. “I’m just excited to see the public use their public lands to better benefit their health and their life,” Jacobson said. Comments about trail implementation can be submitted to Dave Jacobson at djacobso@blm.gov. All comments must be received by 5 p.m. on Nov. 24, 2014.